[A] pleasing throwback to 1970s war-intrigue pictures. 121 min. United Artists. Director: Bryan Singer. Cast: Tom Cruise, Kenneth Branagh, Bill Nighy, Tom Wilkinson, Terence Stamp, Eddie Izzard, Carice van Houten, Thomas Kretschmann. It's a given that a non-fiction movie about a plot to assassinate Hitler has a suspense problem, and the measure of the film's success is how ably the filmmaker overcomes it. Luckily, Valkyrie—a big-budget recounting of the July 20, 1944 conspiracy to reclaim Germany from Hitler—has director Bryan Singer at the helm. Working with screenwriters Christopher McQuarrie (The Usual Suspects) and Nathan Alexander, Singer does a fine job of telling the story of Col. Claus von Stauffenberg, who plotted the failed coup against Hitler’s regime. Tom Cruise plays von Stauffenberg with the right amount of steely intensity, anchoring what’s essentially a heist-like Mission: Impossible style story, only one doomed to an unhappy ending. In the film's opening scenes, we witness von Stauffenberg wounded (including the loss of his left eye) while serving with the 10th Panzer division in Tunisia. Once office-bound, von Stauffenberg finds himself recruited into the highest levels of the German Resistance by Major General Henning von Tresckow (Kenneth Branagh) and General Friedrich Olbricht (Bill Nighy). These men, along with General Ludwig Beck (Terence Stamp) and others, are determined to assassinate the Fuhrer, but von Stauffenberg offers that they're overlooking the little detail of a country thrown into chaos. The solution: redraft existing government emergency plan Operation Valkyrie to streamline the restoration of order in the hours after Hitler's death. The reworking of Valkyrie has its own challenges: only with the approval of General Friedrich Fromm (Tom Wilkinson) and Hitler's own signature on the paperwork can Valkyrie be amended. Of course, the suspense must partly emerge from how the near-brilliant plan unravels and what happens next to the conspirators (including, eventually, Eddie Izzard's General Erich Fellgiebel), but Singer and the thoroughly fine cast skillfully get audiences gripping armrests even as the characters come within a hair's breath of killing Hitler, an event we know cannot happen. McQuarrie & Alexander manage to hew closely to history in a procedural fashion while also layering in some interesting arguments about what can and cannot be accomplished, how it might be accomplished, and whether or not the gamble is worthwhile. Committing the crime of being merely good during Oscar season, this pleasing throwback to 1970s war-intrigue pictures didn't quite get the attention it deserved, but solid box-office receipts and home-video performance should help Cruise's reconstituted but struggling United Artists to remain viable. Valkyrie gets expert A/V treatment on Blu-ray. Shot on film, this 2008 release has a fresh, clean source, resulting in naturalistic color, light and shadow. In lower light, the image can get a bit noisy with grain, but that's to be expected; contrast and color are spot-on. Especially when the action is at full bore (the opening bombing sequence, for example), the DTS-HD Master Audio 5.1 mix can really strut its stuff, but even in its subtler moments, this is a definitive presentation. The bonus features on this two-disc BD set are truly remarkable. Besides an audio commentary by Tom Cruise, director/producer Bryan Singer, and co-writer/co-producer Christopher McQuarrie and an audio commentary by McQuarrie and co-writer Nathan Alexander, we get Kevin Burns' feature-length documentary The Valkyrie Legacy (1:54:15, HD), an in-depth look at the historical context and true story behind the film. The depth of the doc is borne out by its list of participants: McQuarrie; Jens Jessen, Matthias Graf von Kielmansegg, and Clemens Schaeffer (conspirators' grandsons); Rüdiger von Voss, Dr. Axel Smend, Astrid Gräfin von Hardenberg, Wilhelm Graf von Schwerin, and Hans-Manfred Rahtgens (conspirators' children); Claus von Stauffenberg's children Berthold Graf von Stauffenberg and Konstanze von Schulthess and granddaughter Sophie von Bechtolsheim; Johanna Rahtgens (conspirator's widow); former Tagesthemen news anchor Ulrich Wickert; German Resistance Memorial Center research fellow Dr. Ekkehard Klausa and director Prof. Johannes Tuchel; conspirator Philipp Baron von Boeselager; publisher/philanthropist Lord George Weidenfeld; University of North Carolina professor emeritus Gerhard Weinberg; University of Cambridge historian Prof. Richard Evans; Hoffmann; U.S. Department of Defense historian Robert J. Hanydk; former U.S. Secretary of State Henry Kissinger; Singer; and Alexander. The material about Valkyrie's making is kept to a respectful minimum, with the lion's share of the doc given over to oral history and extensive archival film and photographs. 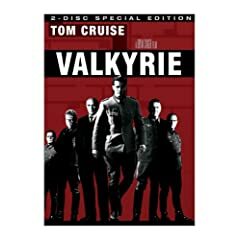 "The Journey to Valkyrie" (15:56, HD) is a pithier making-of, with comments from McQuarrie, Alexander, Col. Stauffenberg's grandson Philipp von Schulthess, Singer, Cruise, producer Gilbert Adler, Bill Nighy, editor/composer John Ottman, Christian Berkel, executive producer Chris Lee, production designer Patrick Lumb, Kenneth Branagh, Eddie Izzard, military advisor Markus Albrecht, Thomas Kretschmann, WWII Berlin resident Doris Egbring-Kahn, cinematographer Newton Thomas Sigel, and government spokesperson Ulrich Wilhelm. Von Schulthess plays Berlin tour guide in "The Road to Resistance: A Visual Guide" (9:08, HD), which also includes comments from author/McGill University professor Peter Hoffmann and Col. Fritz von der Lancken's daughter Maria Antonia von der Lancken. "The African Front Sequence" (7:01, HD) examines the shooting, in the Mojave Desert, of the film's opening scenes. Participants include Cruise, Singer, McQuarrie, special effects coordinator Kevin Hannigan, action coordinator/stuntman Vic Armstrong, and picture vehicle department Stephen Lamonby. "Taking to the Air" (7:32, HD) puts a greater emphasis on the use of planes in the same sequence, with Cruise, Hannigan, aerial coordinator Mike Patlin, aerial coordinator Mike Woodley, Messerschmitt pilot John Romaine, Junkers pilot Andy Pister, Singer, and Jamie Parker. "Recreating Berlin" (6:51, HD) covers just that, with Singer, Lee, Cruise, Hoffmann, Lumb, Nighy, and McQuarrie, while "92nd Street Y: Reel Pieces with Tom Cruise and Bryan Singer" (38:57, SD) is a nicely done onstage Q&A. Disc Two houses a Digital Copy for portable media players. 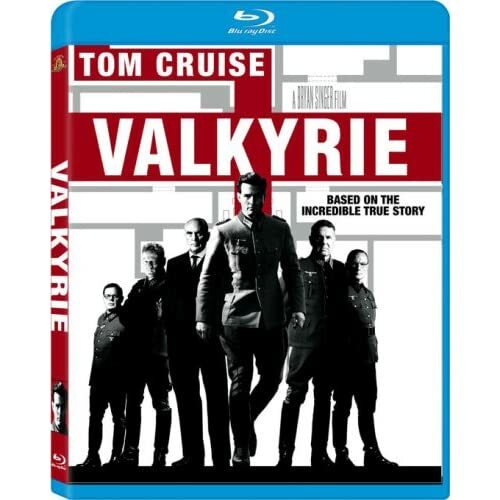 Valkyrie not only deserves a rental, but in this fantastic Blu-ray special edition, a place on your shelf. All site content © 2000-2019 Peter Canavese. Page generated at 04/18/2019 02:17:37AM.